THE NUTLEY SUN (July 20, 1945) -- Official word of the death of Seaman Second Class Ronald Frederick McCormack has been received by his parents, Mr. and Mrs. R. Frank McCormack of Church Street, it was revealed this week. 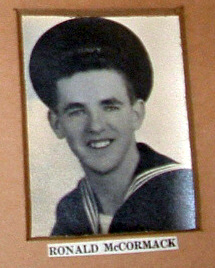 Seaman McCormack was reported missing on June 9, 1944, after he participated in the D-Day invasion of Normandy. He was aboard LST 314. Besides his parents, he is survived by a sister, Muriel.